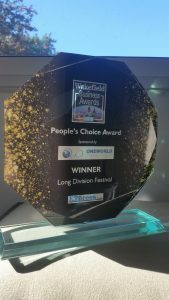 We’re really proud to have been awarded the People’s Choice Award at this year’s Wakefield Business Awards. It wraps up an amazing year for us that has seen us bring more people to Wakefield than ever before, create a huge amount of positive press for the city and commit to creating new work and supporting emerging artists. We certainly didn’t expect to win. We were a nominee in the New Business category but lost out to Wakefield BID, something we had no issue with as the festival simply would not have happened without their support. The evening was coming to a close. Our table was in the back corner of the room, near the bar – not where you’d expect winners to placed. And suddenly our names were called for the People’s Award, and here we are. It was gratifying to be in that room, despite feeling a little out of place among some very large and successful businesses, as that world is something we’ve been trying to crack since 2011. It’s been hard work but after 8 years it feels we might now be at the start of opening minds as to what culture can achieve in Wakefield – and not just inside the walls of world class galleries, but in the city, in the streets. We’ve always tried to bring culture and business together, albeit not with a distinct plan, but through co-operation and collaboration. It’s exciting to see where this goes next. Thanks to all who voted and your all your support.